Bengaluru, 7 November: A significant new study has found that 63% of retailers in the countryside may now be inclined to use the cashless system of payment. The study reports a marked jump in the number of rural consumers willing to use mobile payments, post demonetization, on par with their urban counterparts. In locations with moderate consumption levels, there is also a significant increase in shops that are prepared to pay a transaction charge in excess of 1%. 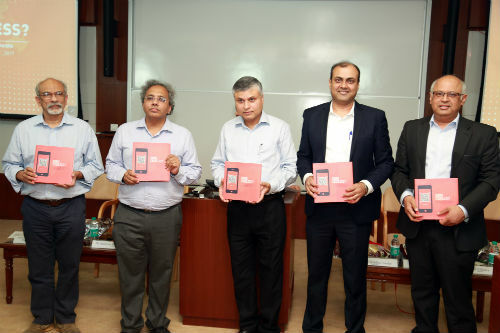 Titled “Going Cashless?”, the research report covering perceptions, usage and behavior, toward digital payments, pre and post demonetization, was conducted by the Centre for Digital Financial Inclusion at the Institute for Financial Management & Research (IFMR) in collaboration with researchers at Digital Innovation Lab, IIM Bangalore. The report was released at the IIMB campus at an event in Bangalore today, a year after demonetisation. Prof. G. Raghuram, Director, IIM Bangalore, described the research report as a useful and timely one. “The focus areas now should be on the challenges, such as awareness creation and literacy. The other areas needing attention are issues surrounding infrastructure and connectivity. I hope all this has policy implications,” he said. The “Going Cashless” report is a spin-off of an ongoing academic study conducted by CDFI, Institute of Financial Management and Research, and the Digital Innovation lab, IIMB on the various factors shaping usage of cash and digital payments amongst consumers and kirana retailers. This study also highlights the key challenges and opportunities to create an inclusive enabling environment for digital transactions across the country. A short film, detailing the making of the report, was aired after the launch. Rupesh Kumar, Head – Digital Payments, ICICI, provided a banker’s perspective, and G S Sastry, Partner, PwC, gave an overview of the impact of digitization on Indian supply chain. Dr. Shashank Garg, Principal Architect, DI Lab, IIMB, delivered the vote of thanks. The “Going Cashless” study was done in two stages – pre-demonetisation (September 2016) and post-demonetisation (Feb-March 2017) with the sample of consumers and retailers from 11 districts across India.